The US section 232 investigation into the national security effect of imports of both autos and auto parts is due by 17 February 2019, but could come as soon as October 2018. So far, a 25% tariff on auto imports has been discussed as a potential penalty. Direct impact for the US after retaliation is near zero on GDP, but more notable on inflation: A 25% tariff on US auto imports would add 0.19pp of GDP before retaliation, but only ~0.01pp of GDP after retaliation. On inflation, Citi analysts estimate the tariffs on autos could add 0.10pp to US Personal Consumption Expenditure (PCE). Direct impact for other countries: The negative impact would be the largest for South Korea (-0.2pp of GDP), Japan (-0.14pp) and Germany (-0.11pp). 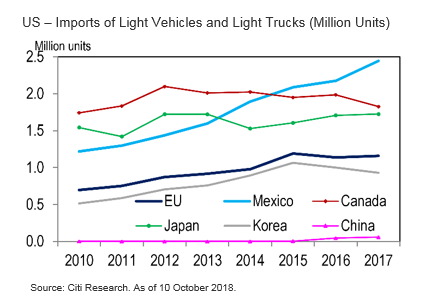 The US-Mexico-Canada (USMCA) deal includes a side letter that would protect Mexican and Canadian passenger vehicle exports up to 2.6million units against the national security tariffs, which would provide ample room for growth. Luxury automakers have greater ability to absorb the impact while taking steps to re-source production over time; this behavior is more plausible for European car imports (about 2/3 are in the luxury category). Non-luxury vehicle imports from Japan, Europe and South Korea appear to represent approximately 14% of the US market, or 2.4 million units. This is a fairly significant amount of vehicles under a scenario where all three regions become subject to 25% vehicle import tariffs. US automakers could gain market share in such a scenario.